Life without Windows or OS X: Unlimited data service at 2.5G speeds for $50 a mouth.. Unlimited data service at 2.5G speeds for $50 a mouth.. Ever hear of Simple Mobile? Don t worry most have not. Simple Mobile is what’s called a mobile virtual network operator, MVNO for short, that uses T-Mobile’s network. Simple, which runs on a bring-your-own-phone model, rents out a national GSM network for its service. Simple Mobile's business model, customers can add the MVNO's service to any unlocked GSM phone. Customers can call Simple Mobile's customer care--which the firm outsources--to get help activating their service. Unlike some cellular programs which limit your choices to just a select group of phones, they support more than 180 different handsets; the iPhone 4, Samsung Google Nexus S, Nokia E72, and G2X to name a few. Note: Currently Blackberry Instant Messaging, BlackBerry Internet Service, and Social Network services are not supported. Blackberry OS 6 devices are not supported. Blackberry is only Web accessed via Opera Mini browser and Gmail via the Gmail application. 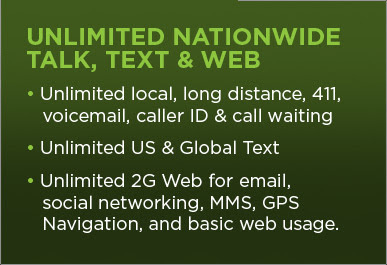 SIMPLE Mobile’s existing $50 prepaid plan has been rebranded to $50 Unlimited Nationwide Talk, Text & Web plan. Previously, this plan included 100MB’s of data, which wasn’t enough for a lot of people. The new plan has unlimited data service at 2.5G speeds, which is adequate for IM, MMS, Web browsing , Email social networks and looking up maps. Need more speed? The $60 plan includes unlimited data at up to 4G speeds. However only phones that support T-Mobile's HSPA+ network technology would qualify as supporting 3G or 4G speeds. In other words, for 3G to work, make sure your phone supports the 1700Mhz band. If you use AT&T branded phone like the iPhone 4 or Samsung Infuse you will only get 2G speeds. If you are usually close to a wifi hot spot there is no need to play for date plan. For $40 you get unlimited voice and texting. SIMPLE Mobile does not have a 1GB limit. I hear that a lot... How ever, they do have Terms & Conditions which will explain prohibited usage on their network. This includes tethering, live streaming, and keeping an open connection over a long period of time.